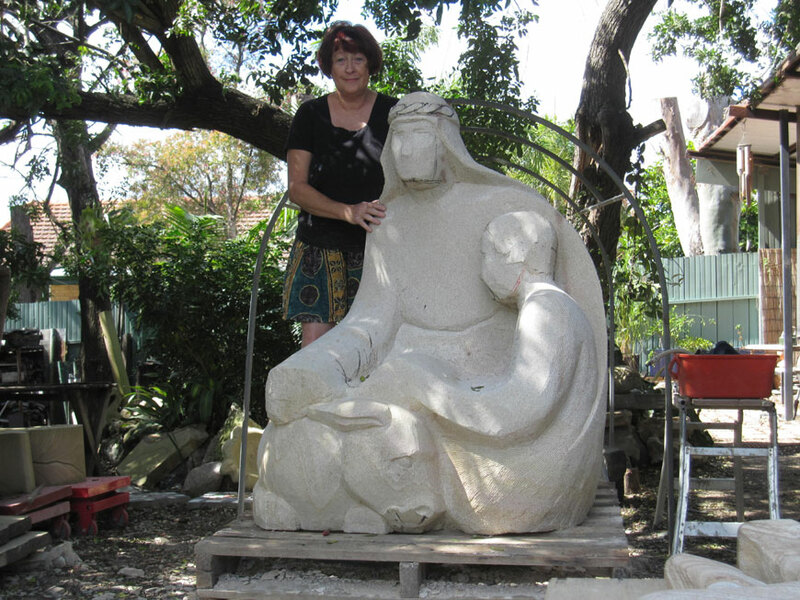 For Queensland sculptor Mardi Kearney, art is a bridge to the spirit. 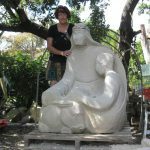 I first started my path to sculpture when my children were little. I bought some clay for them to play with on school holidays, and while playing with them, found that I could express myself with it. I began to model family members and other bits and pieces. 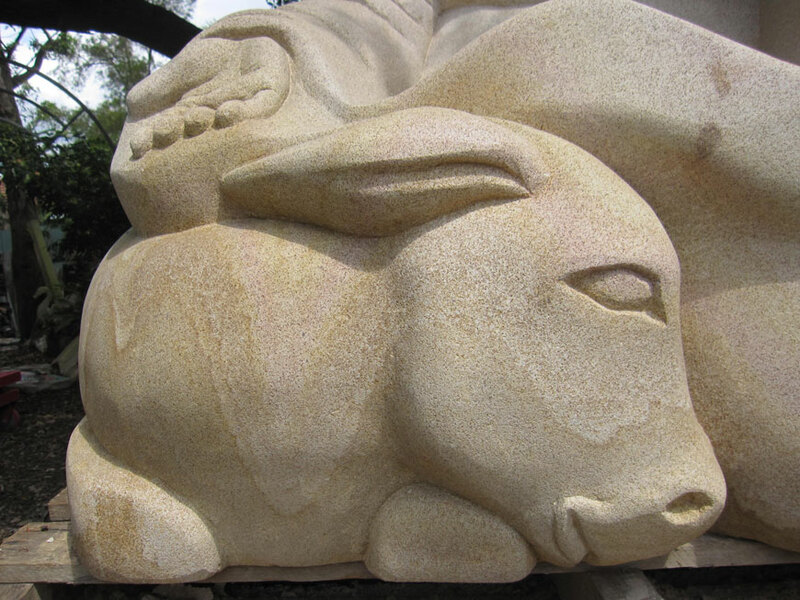 I then found out about firing clay, kiln building and many other aspects of sculptural work. 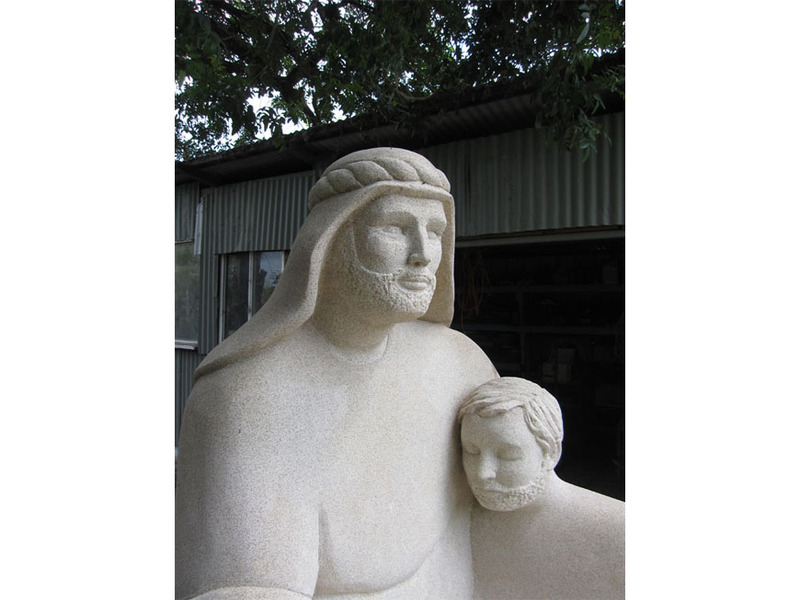 Later, I was asked by the principal of the Marist college where I was working at the time if I would make a sculpture of Mary for the students and staff there. 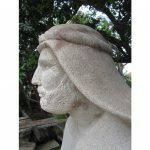 I was somewhat surprised to learn that he wanted me to make it in stone! 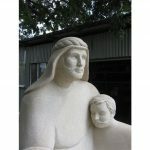 I had never worked with stone or on such a large scale, but my learning curve was exponential. It’s amazing what can be done if you believe in yourself. 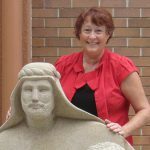 When Robyn Anderson, Principal of Lourdes Hill College, approached me last year to create a sculpture of the Good Samaritan for the college community, I was excited. 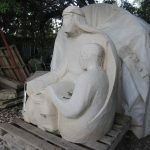 The sculpture was to mark the closure of the boarding section of the college and to pay tribute to the many students and staff who had lived and worked at the college from 1916 until 2010. 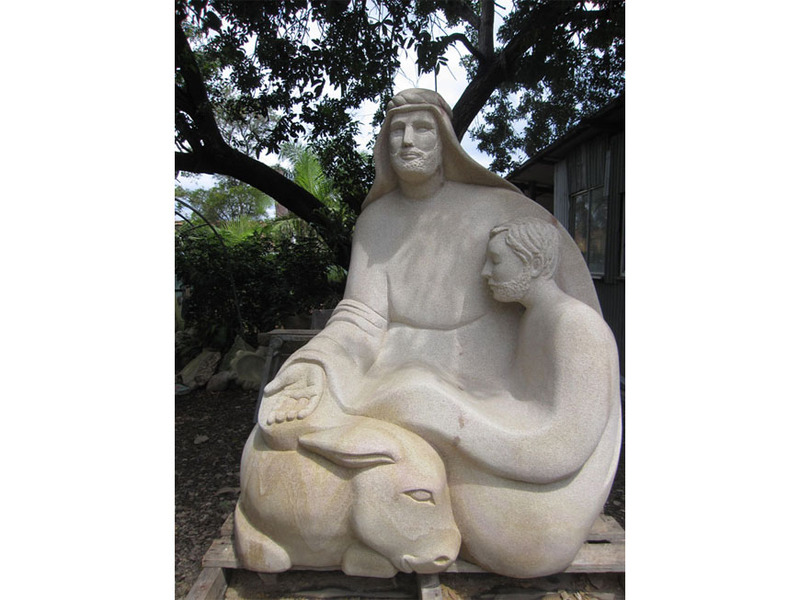 I began the creative process by reading again the parable of the Good Samaritan. 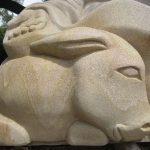 As a younger person, I thought the parable was about helping your neighbour or anyone in need. 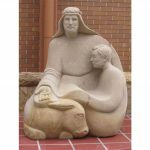 While carving the sculpture and thinking of the parable often, I came to see it is not just about helping those in need. It is more about my tolerance of others’ beliefs and actions. It’s easy to think that I can justify not helping others because they don’t believe or act the way I do. While carving I tried to think of an image for the Jew. 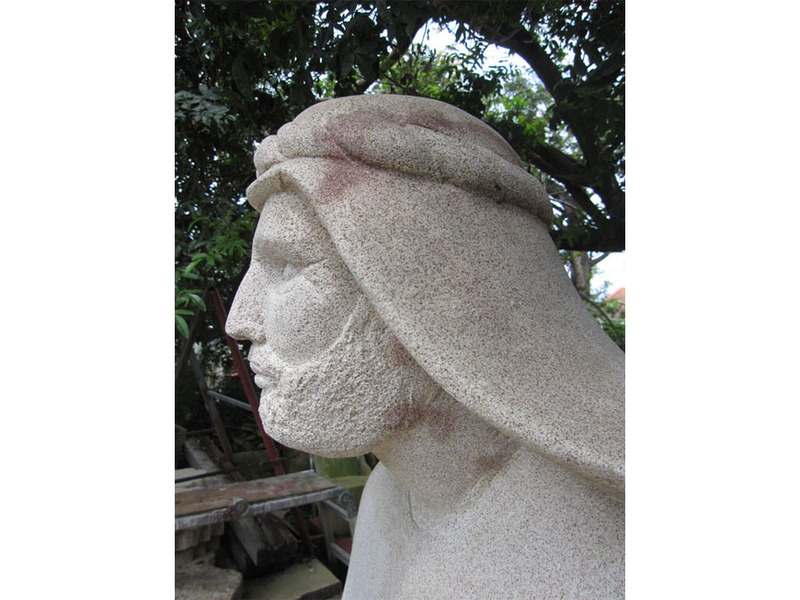 I began to ask: “Who was this person?” Jesus speaks of a Jew, a priest, a Levite and a Samaritan. They all have parallels to people today. I can make my life easy if I have an excuse not to help my neighbours, just as the priest and the Levite did. It is much easier to say: “I don’t want to get involved”. 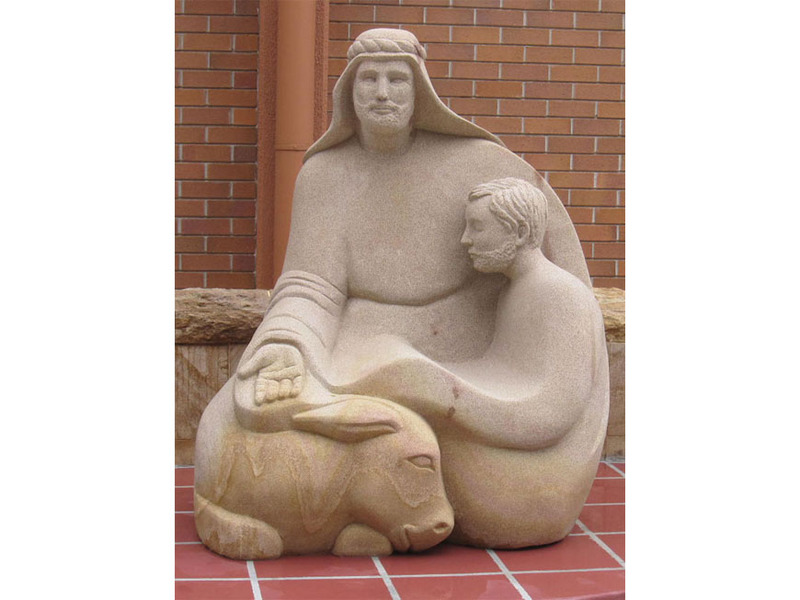 If I take the parable of the Good Samaritan to heart, my life becomes much more of a challenge. 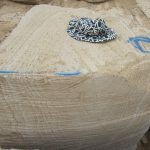 Words are important for me when creating a sculpture. For example, ‘caring’ relates to long soft curves, ‘nurturing’ to soft encircling lines and ‘hope’ is reflected in uplifting lines. 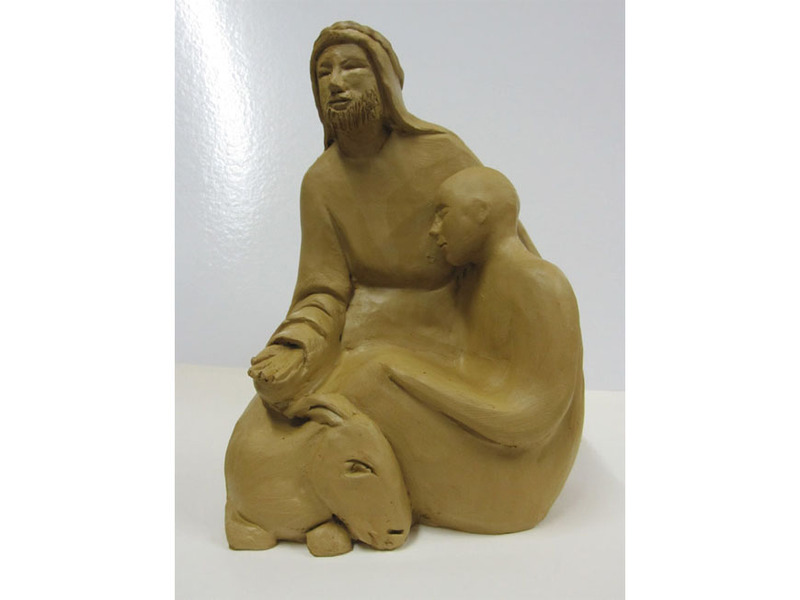 After reading the parable of the Good Samaritan, I sat back and waited for the words to bring forth ideas. I began to sketch, drawing lines over and over until I ended up with a shape that met the criteria. 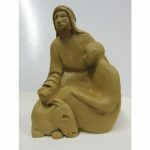 A simple cross-over figure of eight represented the Samaritan and the Jew. I made several small maquettes (scale models) so that I could get the idea of form and balance. 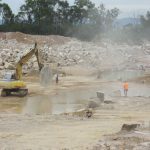 A visit to the quarry at Helidon, near Toowoomba, was next on the agenda. I walked around for several hours until I found a block of sandstone that I thought would work. 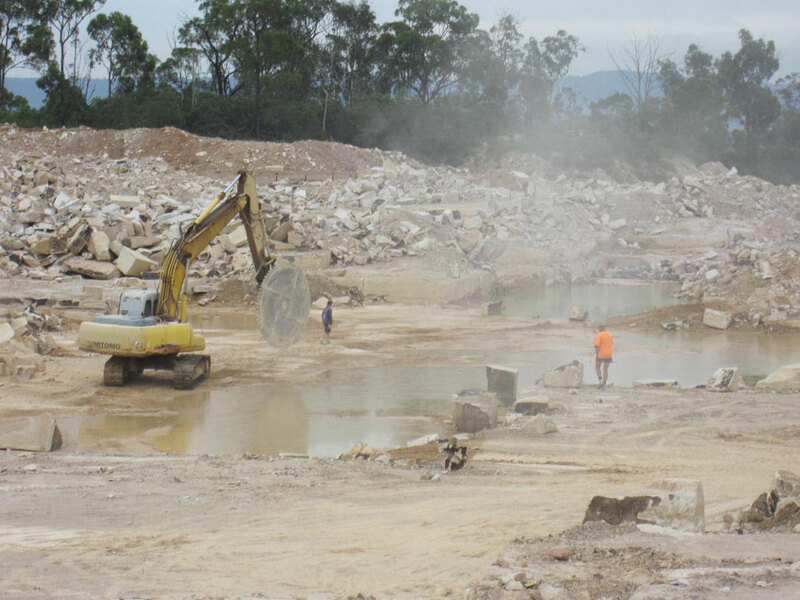 The men at the quarry then cut it so I could see the colours and form. This stone is from the Jurassic period and about 100 million years old. I get a thrill when I come across small plant fossils and think that they haven’t seen daylight for so long! 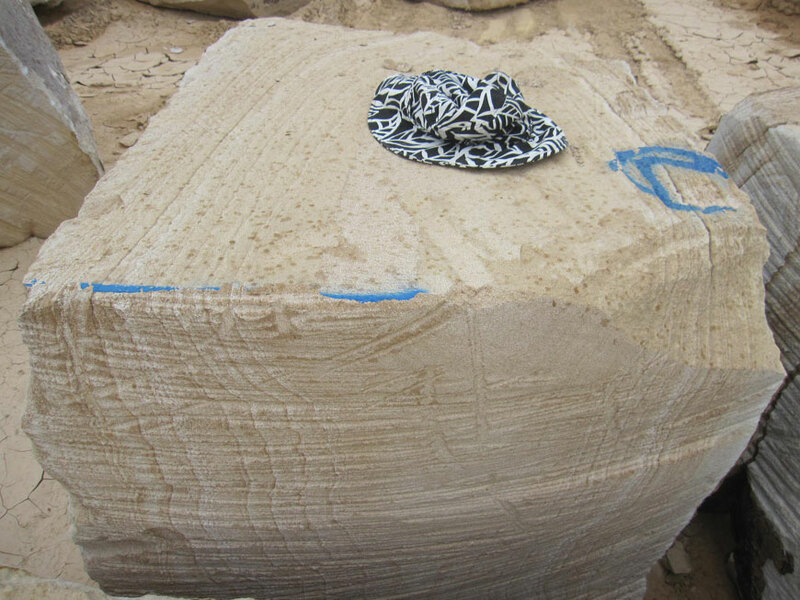 Once my block of sandstone arrived home into the safety of my backyard, I began to draw lines all over it until I could see where the figures were. Then, I just started to chop. 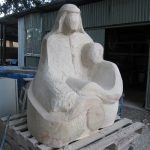 It usually takes me about six to nine months to carve as I do all the work by hand. 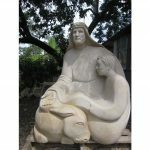 For the Good Samaritan sculpture, I began in early May and finished in late October. I worked most days on it, but not weekends. I have to keep my neighbours happy! I always go through stages of loving the work then getting so frustrated with it that I have to cover it up with plastic! After a break and some housework, I see where I should be going. Moving my sculptures into place after months of creative challenge and back-breaking work is always a stressful but exciting time for me. 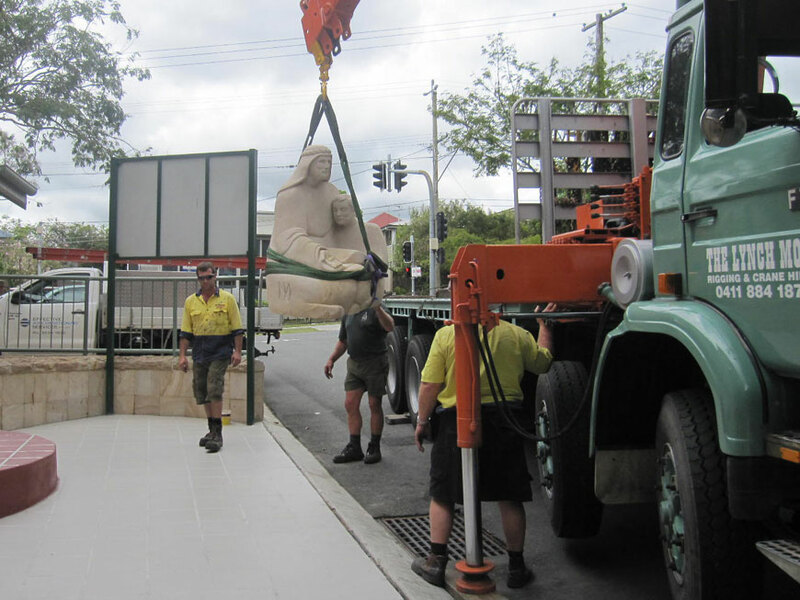 The sculpture has to be carefully moved, often by crane and truck to its destination. 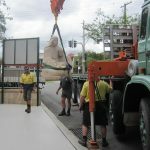 On arrival at Lourdes Hill College, the Good Samaritan sculpture, about two tonnes in weight and 1.5 metres high, was slowly and very carefully placed into position. A sense of relief was obvious on all the faces of students and staff watching on that spring day last year! 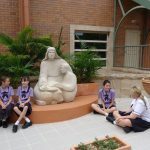 It was particularly thrilling to see some of the younger students walk over and run their hands over the gentle curves of the piece and then sit in the space of the Samaritan’s lap. For me, this is what it is all about! I want my art to exist as a bridge to the spirit. 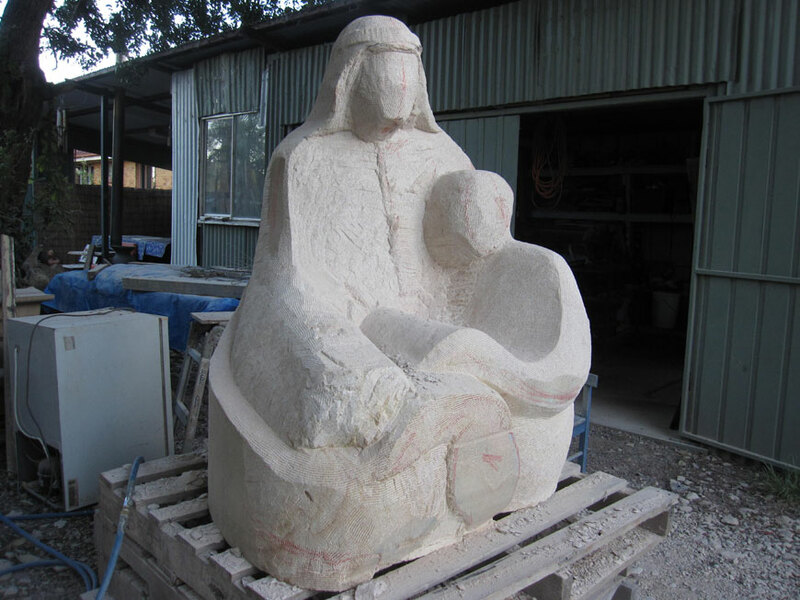 I hope to reach the spirit inside each person who looks at or touches my sculptural work so that they have an experience of the thoughts and feelings I’m trying to convey – human tenderness, care, strength and fragility. 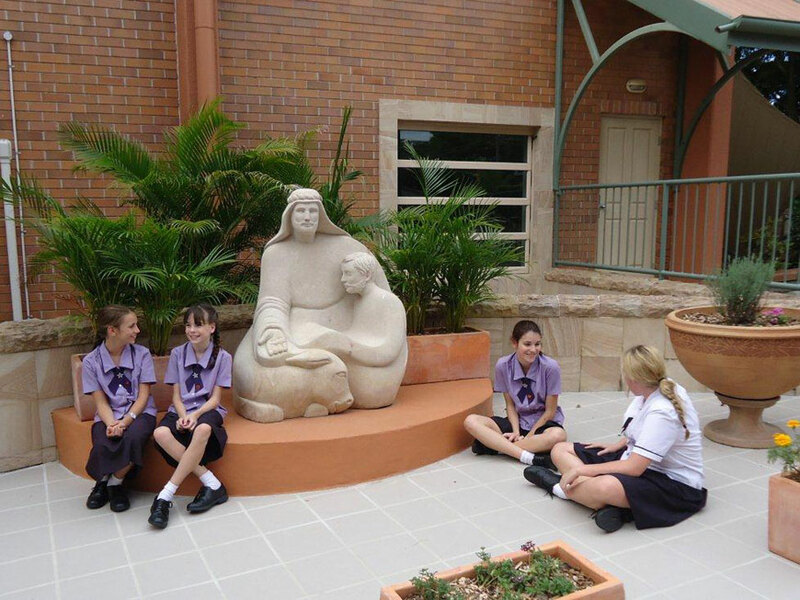 Mardi’s sculpture depicting the parable of the Good Samaritan was unveiled during a ceremony at Lourdes Hill College, Brisbane in November 2011. 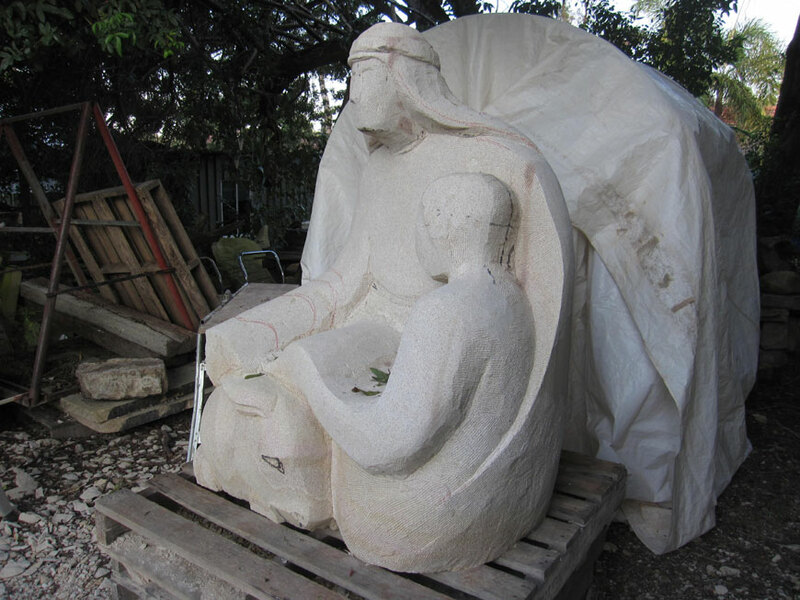 View a series of photos which outline the creation of the Good Samaritan sculpture.